Velcro closure fits multiple bottle sizes. Chills wine in minutes. Store in freezer until ready to use. Keeps wine chilled for hours. Velcro closure fits multiple bottle sizes. 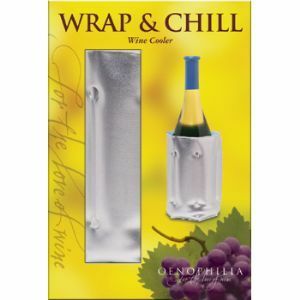 The Wrap & Chill Wine Cooler chills wine in minutes. Store in freezer until ready to use. Keeps wine chilled for hours. Similar to Rapid Ice and Wine Chill brands.